As said by Seniors, the things are quite strange about your desktop. But I assume that your OS is all well, you are having problems with some BIOS settings & need to change them. I warn you that BIOS is the most critical part of any PC to deal, advise & repair. As many machines, so many configurations. So, Proceed only if everything is crystal clear. 1. Disable Fast Boot : Can you find & do it ? You may want to enable secure boot again in future! So. it would be better to backup the keys on a Pen Drive & keep it preserved, untouched & safe. To avoid any problems : copy all the files from the pen drive & quick format the pen drive with default settings. A 4gb pen drive is more than enough. Go through the guide, Backup the keys & get the things done. 3. If you are still not able to boot into win 7, we may need to change UEFI, Legacy,CSM, etc. things. I want to make it clear however that the delay isn't huge, just long enough to notice the difference. Thanks man, i'll read it today. 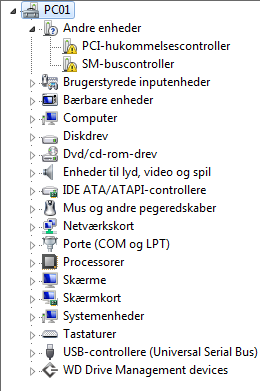 Open Device manager. Is there any yellow alerts of missing drivers? My suggestion is to set WU to manual under services and on WU page set to Never Check and un mark Recommended update. Once a month, manually download and Install the security only updates from Windows 7 SP1 update history . If you have M$ Office or other M$ software, manually search for updates and install only those for Office etc. Now that you mention it i checked and found 2 yellow marks i can't get rid of, i tried letting windows search online for updates but it simply states that no updates where found. Also i have already done the Windows Update stuff, thanks anyway, good catch, might not have done it if i didn't think of it. It's missing the chipset drivers. Good. Please mark this thread as solved.